Part of the Board of Education’s commitment to our district is to continue to look for ways to improve our education system and staying up with current recommendations for improving education is a priority. The Board of Ed feels the health, safety, and well-being of our students is not negotiable. One our main goals is continued work in student success with a focus on our culture and climate. In order to continue to achieve the success we have been known for, we need to keep looking at ways to improve how we are delivering education. 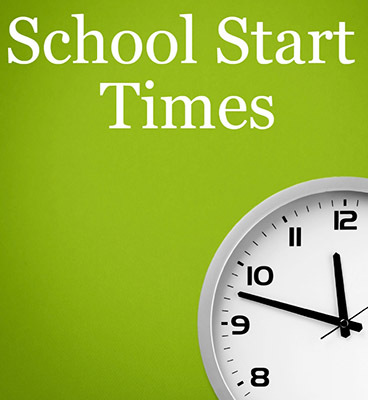 There has been a big movement toward Healthier Start Times and the Board of Education feels it is important to look into this further. Especially considering that we start school at the middle school and high school earlier than most. A few members of the board recently attended a conference on the subject of healthier start times and the data and science behind the concept of a later start time was compelling and indisputable. There were several presenters on the subject, including a keynote from Dr. Judith Owens, the Director of Sleep Medicine at Boston Children’s Hospital and the Professor of Neurology at Yale Medical. After the conference, we brought the information back to the board and it was decided that more exploration was needed and we were hopeful that we could make this work for our students. We started with a parent survey to get a feel for what the current environment was like for our students and what daily scheduling looked like for our families. We have met with the bus company and are having ongoing conversations with them as we think of new scenarios and as new questions arise. Our next step was to put together a small study group made up of parents, administrators and board members. The preliminary information was presented to the teachers union. We will be reaching out to the community for further input and hope you spend some time looking at the research to help us make the best decision for our students. Please feel free to contact us with any questions you may have.